When you decide to purchase Timbeter’s services, our team carefully thinks of your needs in the field, indicating the best packages so that you can get the most out of our solution. To fit best for your needs, we have created two types of packages: the first one based on the number of measurements you intend to make and, the second with unlimited images and all access to the storage module. In addition, you can also purchase a package with unlimited measurements from Timbeter Container, a solution made especially for those exporting logs to Asia. Our most popular service is the monthly package per device has unlimited measurements and gives full access to the storage module, where you can create reports and organize inventories. In addition to unlimited measurements, the user can also redo measurements through the module and check the measurements made in the field after device synchronization. Still on the storage module, the account admin can add an unlimited number of storage module users who will have access to it, with different administrative functions. It is also possible to create different storages within the same account. 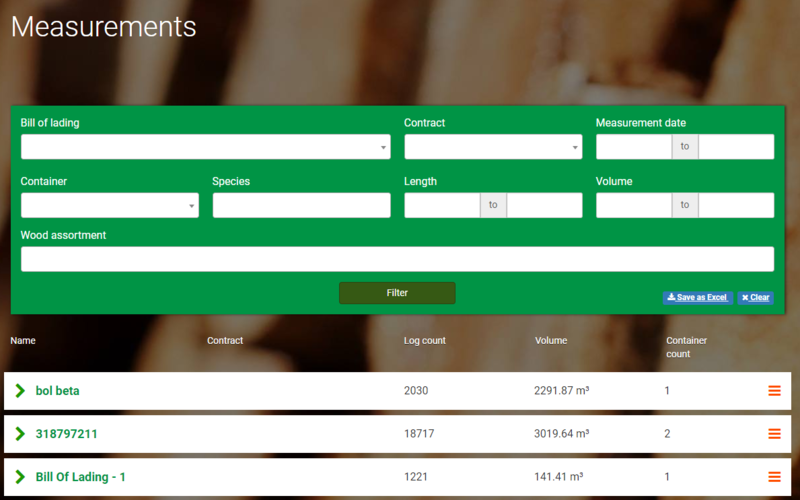 The user has full and customizable access to the species, qualities, assortments and culls of the logs, making the solution much more complete. It is also possible to integrate Timbeter through API, bringing much more convenience to your operations. In addition to all the functionalities, our team is always on hand to carry out all necessary support, updates of the software and customized developments – integrations, personalized reports, etc. – that may have a separately agreed rate. Timbeter Container has all the functions of our solution above listed, with also bills of lading for all containers making it easier to share between sellers and buyers. Even though the monthly subscription is the most popular among users, we created also a picture-based package, developed especially for users who want to make sporadic measurements or have smaller volumes of wood. You can choose between 5, 10, 20 or 50 measurements and divide them into one or more devices. When the measurements are over, you can purchase a new package. The first 10 images of Timbeter are offered free of charge and our team is ready to offer a one-week organizational trial with unlimited images and access to the storage module. The monthly price per device of the unlimited license of measurements is 150 euros. The Timbeter Container version per device with unlimited images and access to the storage module is 250 euros per month. Please contact us at info@timbeter.com to make a quotation according to your needs and our team will contact you promptly. Our forms of payment are: credit card, PayPal and bank deposit. Get to know how Timbeter will improve your log measurements.